Book as low as P499 base fare via the new Cebu Pacific promo fares for your travel in the next 5 months. Featured on the latest Cebu Pacific sale tickets are flights from/to Manila to various Philippine destinations. Many popular places are included on the seat sale including Boracay, Iloilo, Bohol, Coron and several others. 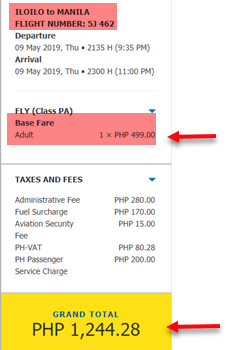 The affordable flights of Cebu Pacific are valid for trips from March 1- July 31, 2019. Booking for this promo is until February 4, 2019 or until sale tickets last. Limited promo fares on sale! Book or buy tickets ASAP! 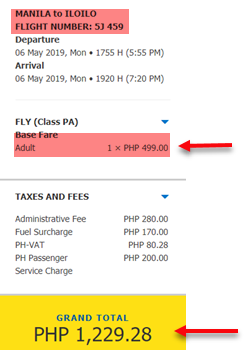 How to get Cebu Pacific Sale Tickets? 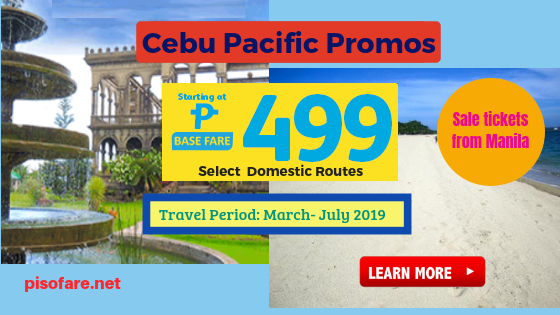 Booking online at www.cebupacificair.com without using promo code. Buy promo ticket at Cebu Pacific sales and ticket offices as well as accredited booking offices and travel agencies. Contact Cebu Pacific Reservation Numbers. Promo fares of Cebu Pacific cover only one-way base fare and 7 kilos hand carry baggage. Excluded are Web Admin Fee, taxes, Fuel Surcharge and Domestic Terminal Fee. Will you be bringing heavy luggage or more than one bag? Save on checked baggage fee by purchasing prepaid baggage allowance which you can do while booking your ticket or via Manage Booking tab at the airline booking website or visit Cebu Pacific sales offices. Be updated on promo fares 2019 to 2020, Like us in Facebook: PISO FARE TICKET to receive seat sale updates in your newsfeed!